Reader Chris brought the sad lack of reviews on the internet of this film to my attention recently, and I am surprised. 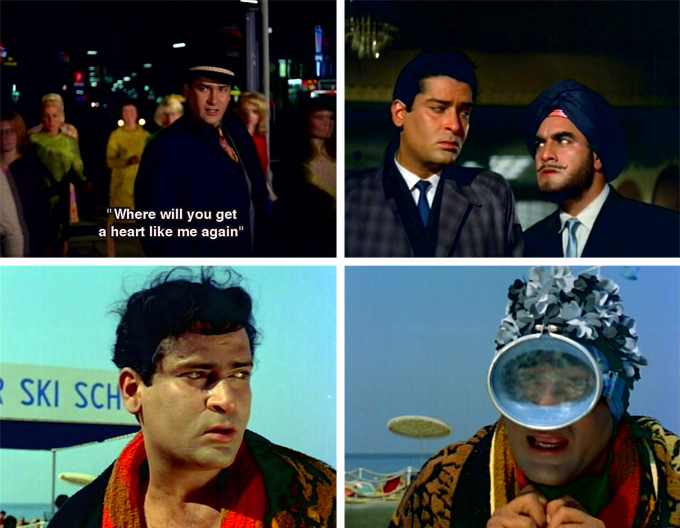 This is a really fun film, and though Shammi is admittedly towards the end of his career as a hero, he is still the Shammi who made hearts go pitter-patter. The songs are classic Shanker-Jaikishan-Rafi-Shammi, with the dance-off between Helen and Vijayanthimala probably its most well-known feature. But there’s so much more to it than that! Shammi is less exuberant than the Yahoo Shammi of early in the decade, which gives his performance a more subdued realism. He plays Prince Shamsher Singh, the jaded, bored, arrogant son of the Maharajah of Ramnagar (Ulhas); the film is about how wealth and privilege do not guarantee happiness, not by a long shot. This theme—and the setting, at the twilight of the Princely States—may be be trite, but they are no less valid; and the screenplay and story are penned by none other than Abrar Alvi. And the supporting cast…let’s just say it is a gift that keeps on giving. More like a gay cowboy than a gay knight, but what does it matter when he’s so so very handsome? But why isn’t he in color? I WANT TO SEE HIM IN COLOR. For me, An Evening In Paris = Pran’s bright orange Joker hair + lovely songs. 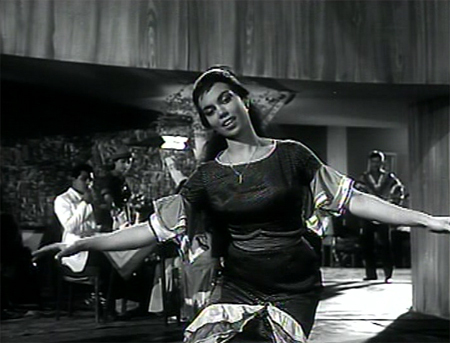 It’s not one of my favorite Shammi films, although there is lots of pretty—especially Sharmila. In fact, everyone should have two hours of footage like this of themselves looking impossibly glamorous, heart-meltingly beautiful, and haughtily chic. If I were Sharmila I would probably watch this every day. 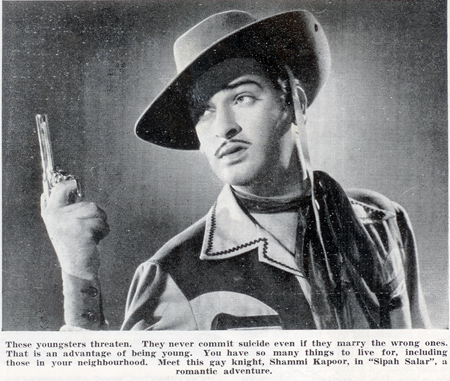 Shammi is quintessential Shammi: he looks a little the worse for wear around the edges, but retains his considerable charm and his willingness to make a complete idiot of himself (one of my favorite things about him). I think my main quibble is with the plot, which is all over the place (literally! ), too long, and brain-dead in places. There’s also a complete lack of real character development. It’s as if Shakti Samanta just needed a backdrop for the music and stars and didn’t care about the rest; unfortunately it gets tedious, stylish though it is—the fashions and hair and sets, oh my! 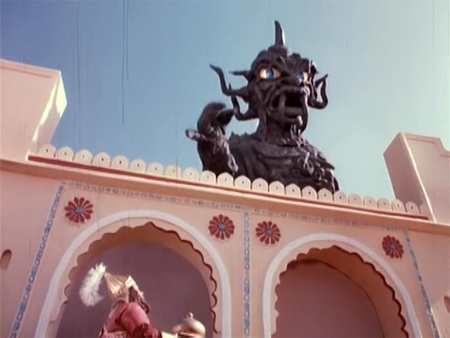 Plus it’s lovely to see the locations (Paris, Switzerland, Beirut, the Niagara Falls) as they were during that era, even if we are required to believe sometimes that Paris is filled with signs in German and that the French countryside looks just like India. I don’t even know what to say today…thanks to all of you who have come here to share your tributes and sorrow with me. He will always have a special place in my heart and I am so blessed to have been able to experience his warmth and enthusiasm and love of life in person: it never diminished, and now it never will. Rest in peace, you lovely, lovely man. I like to picture you reunited with your beloved Geeta, and I wish for everyone whom you loved so much—especially Neila Devi, Aditya and Kanchan—to find strength in that love now. A star that shines as brightly as you always have can never ever be dimmed. 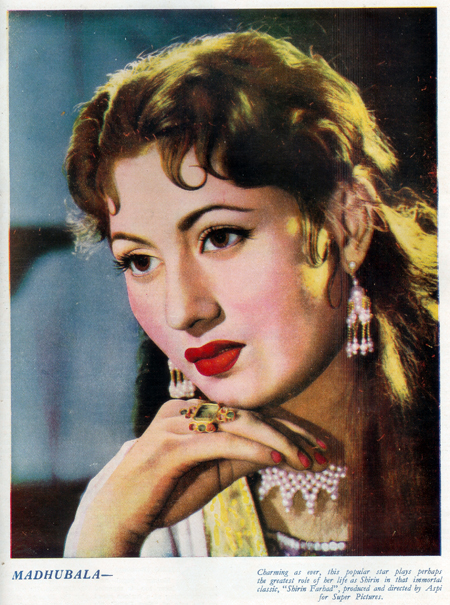 It is a fact that when I started this blog I had grandiose plans to cover every single film Shammi ever starred in (well, that I could find, anyway). Little did I know how distracted I would become by so much other stuff, but here I go in a valiant attempt to move a teeny bit forward towards that lofty goal. The Shakti Samanta-Shammi team made several memorable films and I think this is their first together. It has its entertaining moments, but after the first hour or so begins to drag for me. 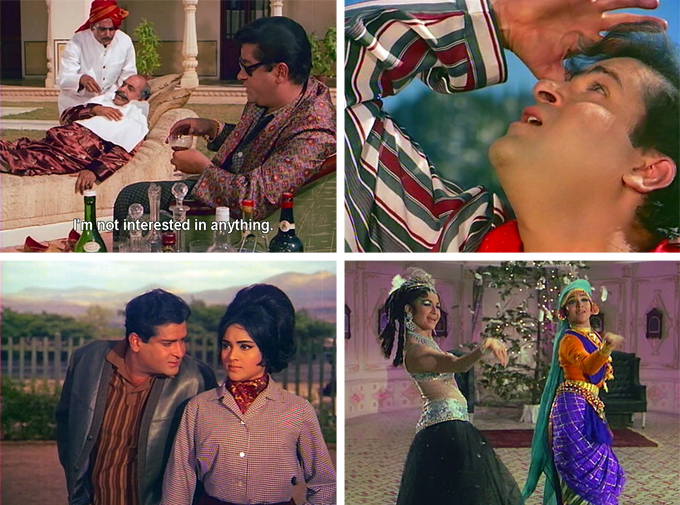 The songs are lovely (Shankar-Jaikishan); Shammi is lovely LOVELY (even in disguise); Padmini and Shashikala and Malaysian actress Maria Menado are lovely; but at the end of the day this isn’t one I want to watch over and over. Shammi’s exuberance seems to have nowhere to go and it fizzles; his chemistry with Padmini is tepid and although I am a fan of Agha, he is not the Shammi sidekick that Rajendranath was. Now available with subtitles thanks to Tom and Raja! It is not perfect but I found it deeply engaging and sensitive: it is largely about loss, and I think it is one of Shammi’s best performances. Sometimes I just have to ask myself if I live in a cave or something. Why have I not seen this movie before?! I could have seen it ten times by now! Why am I so late to this party?